The sealing disaster of 1914 is one of the big spring themes in the DNE and in Newfoundland and Labrador more generally. 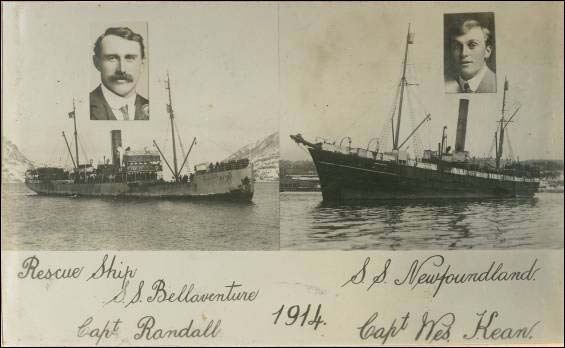 Pictured here are the S.S. Newfoundland, the sealing ship involved in the disaster, and the S. S. Bellaventure, a rescue ship. Photo courtesy of Maritime History Archive (PF-345.009). “Spring in The Bronx” Anon. This old familiar rhyme comes to mind as the snow storms and frigid days slowly become distant memories. March signals Spring Equinox and the return of more comfortable temperatures. Those in Newfoundland and Labrador know that winter isn’t truly over until after the May 24th Victoria Day weekend when it is possible to get snow, as wild as that may sound to those residing outside the province in warmer areas. Snow storms are common in March and one of the names for a March storm is sealer’s batch. There is only one citation in the word-files for this term so it was not used in the DNE as further evidence would be needed for its inclusion. Batch, however, is widely attested. Word-file for ‘batch’. Reproduced by permission of the English Language Research Centre, Memorial University, St. John’s, NL. 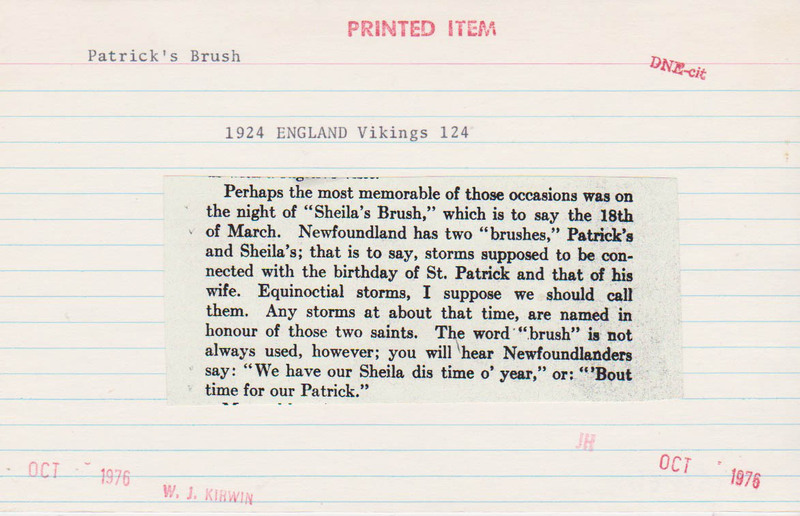 Spring in Newfoundland and Labrador tends to hold off until well after Sheila’s Brush and Patrick’s Brush. In the province, just when you think the temperatures are getting back to agreeable and the snow is disappearing, Sheila and Patrick unleash their fury a last time (or several times!) with snow and/or ice storms that shut cities down. Both Sheila’s and Patrick’s Brush usually come in March with Patrick coming closer to St. Patrick’s Day. 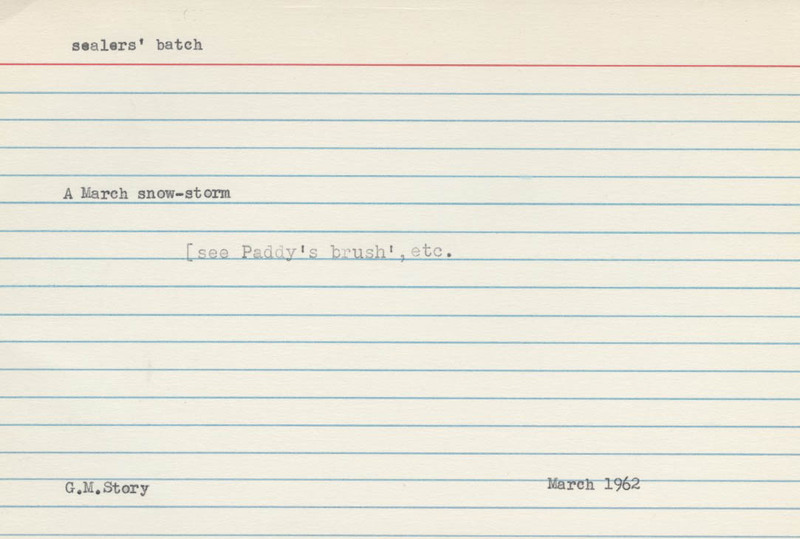 Word-file for ‘Patrick’s Brush’. Reproduced by permission of the English Language Research Centre, Memorial University, St. John’s, NL. The start of Spring, historically, and presently for some, also signals the start of the seal hunt and the spring fishery. Especially when the migratory fishery was booming, fishermen would arrive in the spring from the West Country. 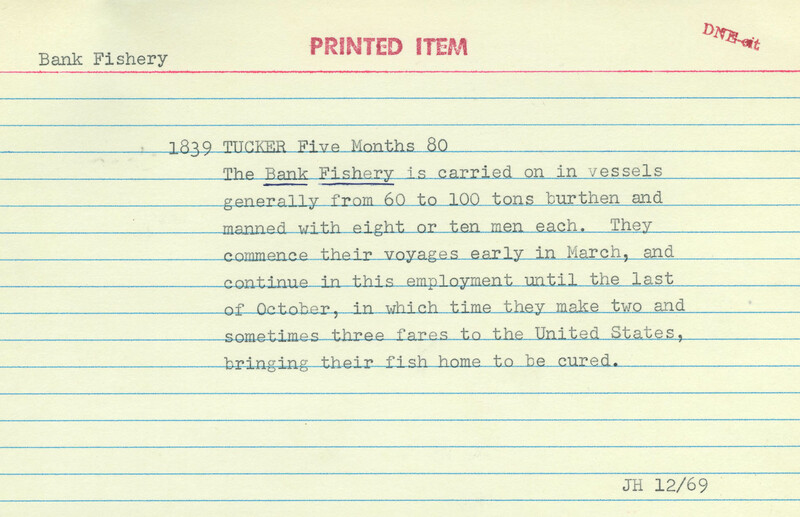 ‘Bank Fishery’ word-file. Reproduced by permission of the English Language Research Centre, Memorial University, St. John’s, NL. Although a source of controversy today, the seal hunt is an important part of the way of life for many people of Newfoundland and Labrador. Much of the issue stems from the often grotesque images circulated in the media and, indeed, from some of the terms used by sealers. One example from the DNE word-files is Bloody Decks. When the winter has been long and the month of March sees heavy ice and mauzy weather, the conditions are right for a bumper season and a toast may be made to Bloody Decks. 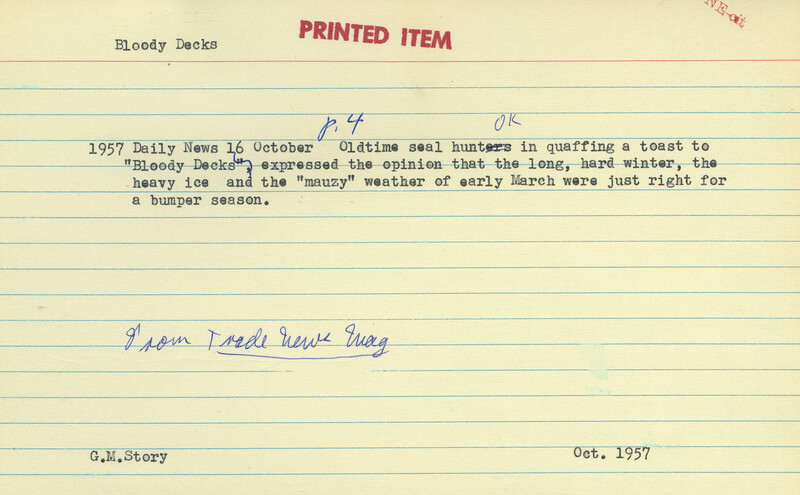 Word-file for ‘bloody decks’. Reproduced by permission of the English Language Research Centre, Memorial University, St. John’s, NL. The migratory fishery was a different beast altogether. 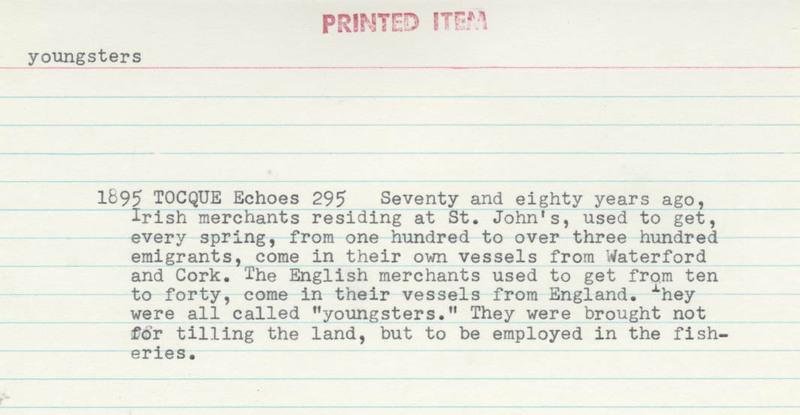 Spring would see hundreds of youngsters, a term for those from England and Ireland who came to fish Newfoundland waters, coming in to the ports and harbours. Perhaps we have new unexamined terms for those coming to work in the oil industry today! Word-file for ‘youngster’. Reproduced by permission of the English Language Research Centre, Memorial University, St. John’s, NL. March is the time when farmers and gardeners start preparing for the summer season. 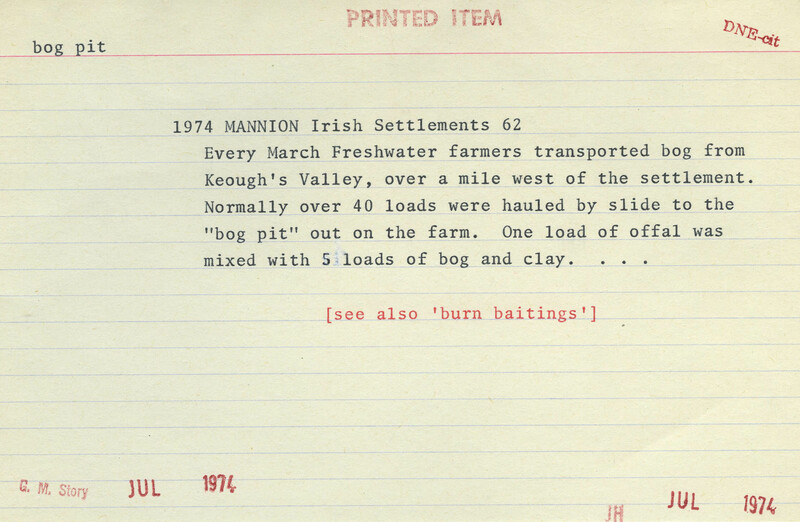 One way to prepare is to make a bog pit by hauling loads of bog and mixing it with such materials as offal and clay. ‘Bog’ word-file. Reproduced by permission of the English Language Research Centre, Memorial University, St. John’s, NL. One might also gather doolamaun, which refers to a type of seaweed that is edible in March. Doolamaun is from the Irish dualamán. This word was ultimately placed in the withdrawn files of the DNE collction. Other preparations, such as woodcutting for the next year start, in March. If one had a boat, they could cruise the wood back home. 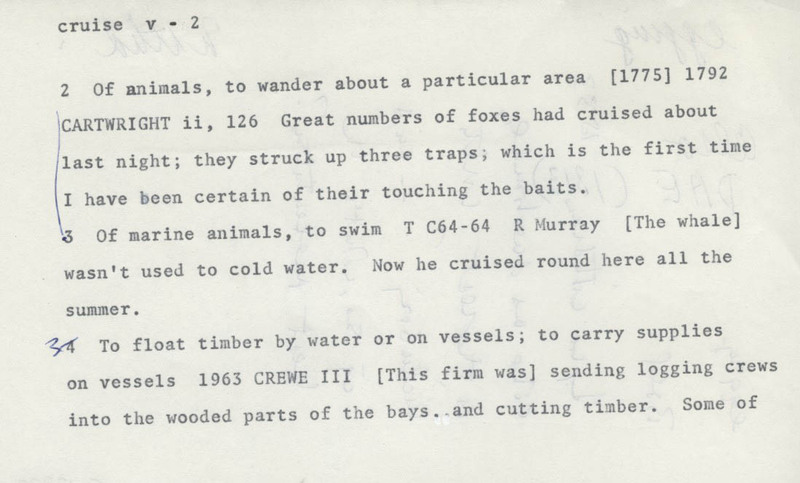 Word-file for ‘cruise’. You can tell by the ‘3’ that his sense is the 3rd sense of ‘cruise’ according to the DNE editors. Reproduced by permission of the English Language Research Centre, Memorial University, St. John’s, NL. An interesting custom, considered ancient in 1693, entitled any boat or fisherman entering a harbour after March 25, just after the start of fishing season, to become Admiral of said harbour. One can see, then, why it would be important to get to the intended destination as close to the start of the fishery as possible. Word-file for ‘fishing’. Reproduced by permission of the English Language Research Centre, Memorial University, St. John’s, NL. After a long winter, it isn’t surprising that some folks might like to celebrate, especially around Easter. The King William parade is one of these celebratory events. The citation shown here was selected for billy but was then withdrawn as that particular usage of billy was not Newfoundland-specific. Word-file for ‘billy’ from 1969. Reproduced by permission of the English Language Research Centre, Memorial University, St. John’s, NL. 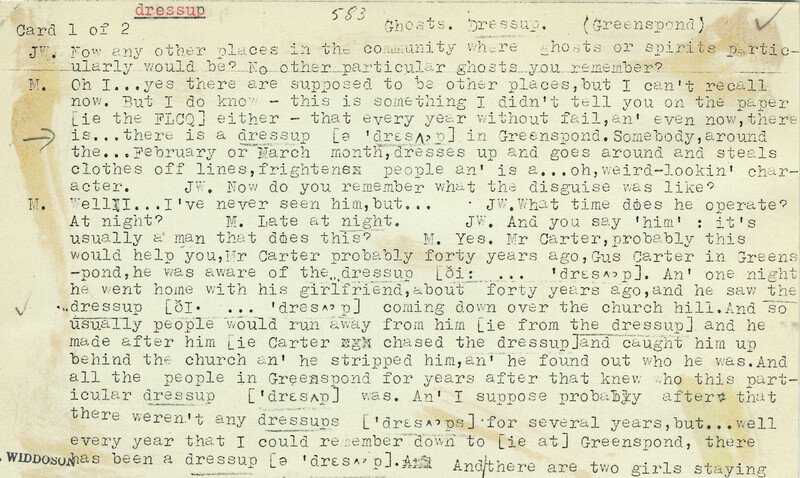 There is an interesting report from Greenspond in the 1960s of a dress-up where a person goes around the community in February or March and steals clothes from the clotheslines, all the while frightening residents. Word-file for ‘dress’. There are a number of cards like this in the DNE word-files. Thankfully, our student assistants don’t complain too much! Reproduced by permission of the English Language Research Centre, Memorial University, St. John’s, NL. Easter socials aren’t uncommon across the different parishes. Some will have games, and some of those games might involve Old Sal. The word-file below describes one community’s traditions for the Easter social in greater detail. Word-file for ‘old’. Reproduced by permission of the English Language Research Centre, Memorial University, St. John’s, NL. Whatever you do to celebrate a new season, new life and not having to shovel anymore, send us a note on what your spring traditions are, even if your only tradition is opening the windows to blow some of the stink out of the house! 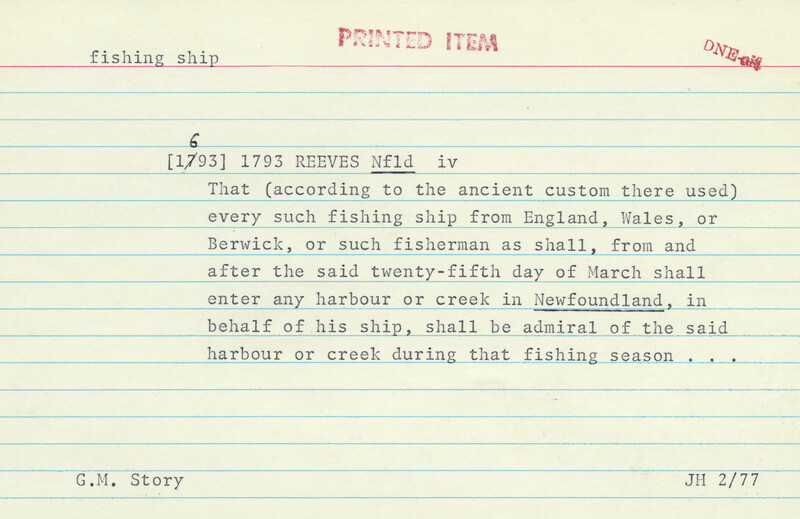 This entry was posted in Uncategorized and tagged Dictionary of Newfoundland English, DNE, Fishery, Labrador English, Newfoundland Englis, Patrick's brush, Sealing, sheila's brush, Spring. Bookmark the permalink. Nice presentation of Dictionary Centre materials. A fun read, too! Thanks Jacob. It’s important for these materials to be online, as you well know from the website. Glad you enjoyed it!